Smaller. 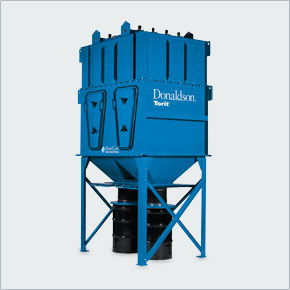 Smarter Dust Collectors only from Donaldson® Torit®. It’s a breakthrough technology like nothing you’ve seen in 30 years of dust collection. Torit® PowerCore dust collectors with PowerCore technology outperform every traditional collector and do so in less space. Smaller is smarter. The Torit PowerCore CP Series dust collector from Donaldson Torit is an extremely small but powerful package that handles high airflow, high grain loading, challenging particulate, and fits into the smallest places. Combined with award-winning Torit PowerCore Filter Packs and patented compact oblique pulse cleaning system, the Torit PowerCore dust collector delivers high filtration efficiencies not usually found in baghouse filtration. The Torit PowerCore dust collector comes in two models: the CPC (stand alone dust collector) is up to 50% smaller than the traditional baghouse and can be ducted to many different applications. The CPV (bin vent) is up 70% smaller than the traditional bag bin vent and can be used on silos, conveyor transfer points, conveyor discharges, blenders and mixers. The Torit PowerCore TG Series dust collector is designed for thermally generated dust and is reshaping the future of dust and fume collection technology. Torit PowerCore TG is in a category by itself with a footprint up to 65% smaller than most cartridge collectors and smarter technology housed in the widest range of completely packaged and assembled units available up to 10,000 cfm. Torit PowerCore TG is the new way to get cleaner air in welding, laser and plasma cutting, and thermal spray applications. On every measurable scale, Torit® PowerCore® dust collectors outperform traditional baghouse and cartridge collectors. The VH Series collectors are smaller, shorter and much more cost-effective. And once your collector is installed, it is so easy to use and maintain, you will never have to think twice about your Torit PowerCore dust collector.